Hours: Police Station is open to the public M–F, 9:00 a.m. to 2:00 p.m. Call 717-902-0627 M–F between 9:00 a.m. and 2:00 p.m. 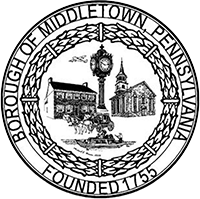 The professional integrity of the Middletown Borough Police Department and its employees is paramount to maintaining the public trust of a community. It is therefore essential to provide for a process by which complaints that allege inappropriate, wrongful, or illegal conduct from both within and outside the Department be received and properly investigated.